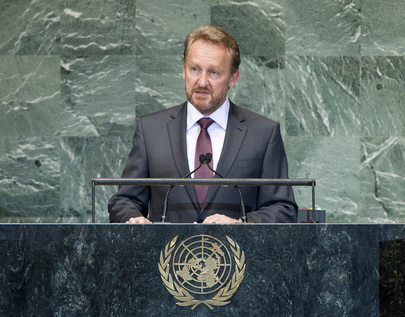 BAKIR IZETBEGOVIĆ, Chairman of the Presidency of Bosnia and Herzegovina, said that today’s world was a scene of unfolding crises and mounting challenges, and first and foremost among them was the disaster in Syria. The regime of Bashar al-Assad was answering the yearning of his people for freedom and democracy with guns and bombs, just as his father’s regime had done 30 years ago. “This is revolting and morally reprehensible — but so is our collective failure to stop it,” he said. Once again, the international community was standing idly by while a human tragedy of dramatic proportions unfolded before its eyes. The images coming from Syria were reminiscent of the tragedy in Bosnia, which had gone through the same horrors not long ago. Recalling that the Secretary-General had visited the Srebrenica genocide site to mark its 20-year anniversary, and there he had said that he did not want to see any of his successors visiting Syria after 20 years to apologize for the United Nations failure to protect civilians. The best way to honour the victims of Srebrenica would have been to learn the lessons of that failure, and not to commit the same errors ever again. Sadly, the United Nations, and especially the Security Council, had failed to do so. “The international community has chosen, yet again, to repeat the trial-and-error pattern of policies that failed in Bosnia and Herzegovina,” he said, adding that the resolutions, statements of concern, ineffective sanctions, observers and no mandate to protect civilians had deadly consequences that had been demonstrated in his country. “Who could have predicted such an explosion of freedom in the Middle East?” he asked. As a Security Council member, he had strongly supported those aspirations for greater freedom and democracy. At the same time, turning to the “deeply troubling” Israeli-Palestinian stalemate, which continued unabated, he stressed that the peace process was not moving forward. “The chain of violence is not broken,” he said. A new impetus to negotiations was urgently needed, because there was no alternative to a negotiated solution. The Palestinians had every right — historic, moral and legal — to a State of their own, and Israel had every right to its security. The occupation must end, but so must the terror and violence. All attempts to create new realities on the ground in the hope that those would become accepted as a starting point must be rejected, he said, adding that Israel should immediately end all settlement activities in the Palestinian territories — the “most serious obstacle to peace”. Moreover, he said, “the state of affairs of 60 or 6,000 years ago is not the right point of reference”. Instead, it should be the principle of peaceful coexistence between two sovereign States that guided a just resolution to the conflict. There was no inherent contradiction between Western and Islamic values, he continued, adding “there is no clash”. There were only those who needed to create a false perception of clash in order to come to power or maintain their hold on power. Many of the world’s societies were in transition, yearning to find a balance between traditional and modern values. The relation between the West and the Islamic world and between their respective value systems would be “one of the most critical issues of our time”. That relationship would pass through crises and periods of misunderstanding and intolerance, but the world must keep searching for a formula, for a model of how to reconcile that relationship. Bosnia and Herzegovina, situated at the westernmost range of Orthodox Christianity and Islam and the easternmost range of Catholicism, represented the meeting point of civilizations — a bridge between East and West. It had enjoyed 1,000 years of tolerance and respect among its citizens; however, a great struggle was now under way between the idea of coexistence and the idea of division. The outcome of that struggle would have a significant bearing on resolving one of the greatest challenges of our time — that of conflict versus cooperation. Indeed, the world was changing at a speed and in a direction that was rightfully worrisome, as inequality, injustice and intolerance were rising. Those unsettling trends would be reversed only by a decisive and coordinated global action, he said.